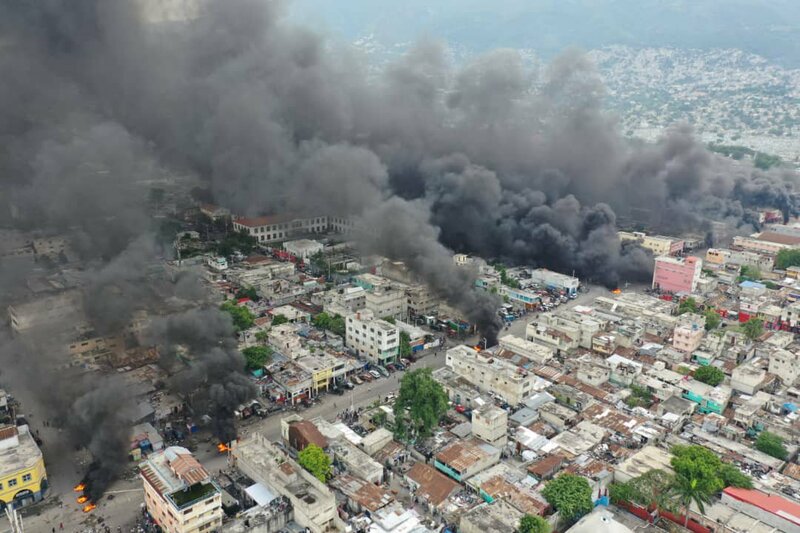 As we write the French Republic is burning and the North American anarchist movement has its eyes fixed on the fires, yet in our own backyard the former French colony of Haiti has been ablaze for months. Since the slave insurrections and struggle for decolonization (a struggle unfinished, we might add) the Haitian people have been in a near constant state of revolt against slavery and colonialism, dictatorships, neocolonialsm, occupation, and a crumbling state. 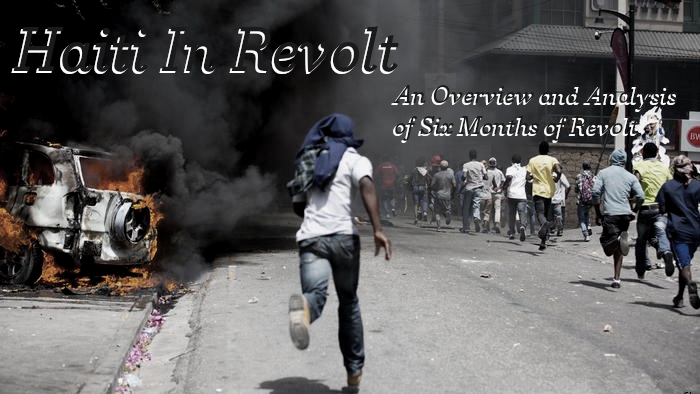 The most recent incarnation of this social revolt started in July against corruption and has spread into a nation wide insurrectionary situation calling for the removal of the U.S backed ruling Haitian Tèt Kale Party (PHTK) and its leader, President Jovenel Moise. 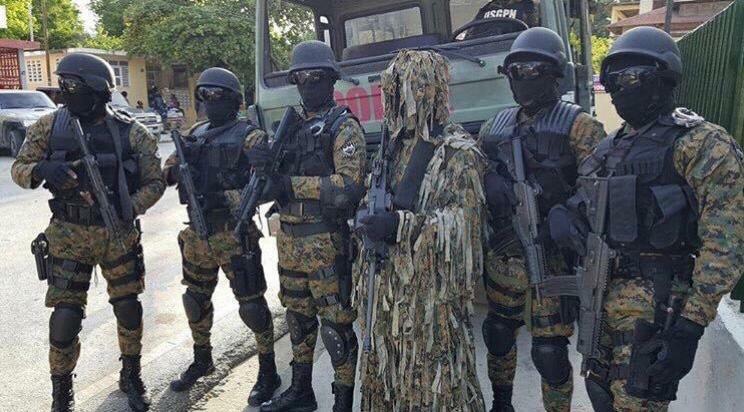 The state has responded with beatings, torture, shootings, massacres, and what many fear to be the return of dictatorship era deathsquads. Rather than crushing revolt, it has only intensified. The election results were rejected by both the Haitian people as well as opposition parties which kicked off protests decrying the fraud and corruption and demanding an annulment. 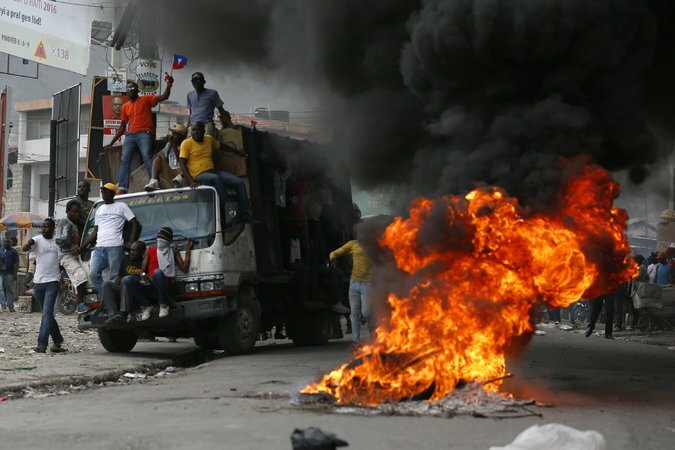 Protests spread across the country and quickly escalated with election offices burned, streets blockaded with burning barricades, and clashes with Haitian National Police and UN “Peacekeepers”. However, against the wishes of much of the so-called “international community”, a lovely name for the United States and the U.N., on May 30th the verification commission recommended throwing out the results of the August 2015 election. The new election was to be held in early October but was delayed as the country, which was still trying to recover from the 2010 earthquake, was hit by Hurricane Matthew. The new election was finally held on November 20th with people from the social democratic Fanmi Lavalas party and the PHTK filling the streets after polling stations closed, claiming they have won. Between the devastation of the hurricane and the Haitian peoples exhaustion from the year long election process, voter turnout for this election was even lower than last time at just 18%. Of that 18% that voted, Jovenel Moise took 55% of the vote and with an ‘absolute majority’ won the election as a whole. Unwilling to accept more years of PHTK rule, again the Haitian people overwhelmingly rejected the results and protests and conflicts broke out, with reports of demonstrations, burning barricades, and gunshots, especially in the La Saline slum which is a major stronghold of social democratic Fanmi Lavalas which called the election an “electoral coup”. On Febuary 7th, 2017, Jovenel Moise was sworn in as Haiti’s 58th President. Already in the people's bad graces and coming into office with suspicions of money laundering, he declared, “we will invest in and cultivate available lands, build roads, bridges, and electricity networks… build schools, dispensaries, and hospitals, facilitate great tourist projects, take all the advantage we can from the HELP and HOPE acts [of the U.S. Congress] by promoting investment in the assembly sector", promises that have gone unheeded. His first year in office was marked blatant corruption as well as by continuous protests, strikes, riots, and blockades for minimum wage increases and against the government that have taken an increasingly revolutionary stance with protesters chanting “Down with the government, down with the bourgeoisie!” The Haitian State has responded with a wide range of repression through strike breaking and firing on workers with live ammo. This cycle of revolt and repression has been ongoing and it’s a pattern that will repeat itself with greater intensity in the next year. An intensely unpopular right wing government riddled with abuse and corruption and wave after wave of protest and revolt in the winter set the stage for a hot summer. In July, using the cover of the World Cup hoping everyone would be too distracted to notice, the government implemented an IMF imposed reform raising the price of gasoline, diesel, and kerosene by 38%-51%, with a liter of diesel costing around 4$ USD and a liter of gasoline costing about 5$ USD. This price hike also meant that costs for public transportation would rise and for a country whose minimum wage is between 215 Gourdes (about 3 USD) to 500 Gourdes (about 7 USD) a day depending on industry any price raise is a large chunk out of a day's wages. The PetroCaribe fund was supposed to be used for social and economic projects as well as reconstruction from the 2010 earthquake. The outrage of this scandal was built upon not just the past months of revolt but years of corruption. Toward the end of August protestors began to hit the street and trying to save face and assert the legitimacy of the state both current and former Presidents back an investigation into the misuse of the funds. Yet protests continued and would continue to escalate into October, which would prove to be a bloody month. A protest was called for Dessalines Day, a day commemorating the death of ex-slave and revolutionary leader in the Haitian Revolution Jean-Jacques Dessalines. 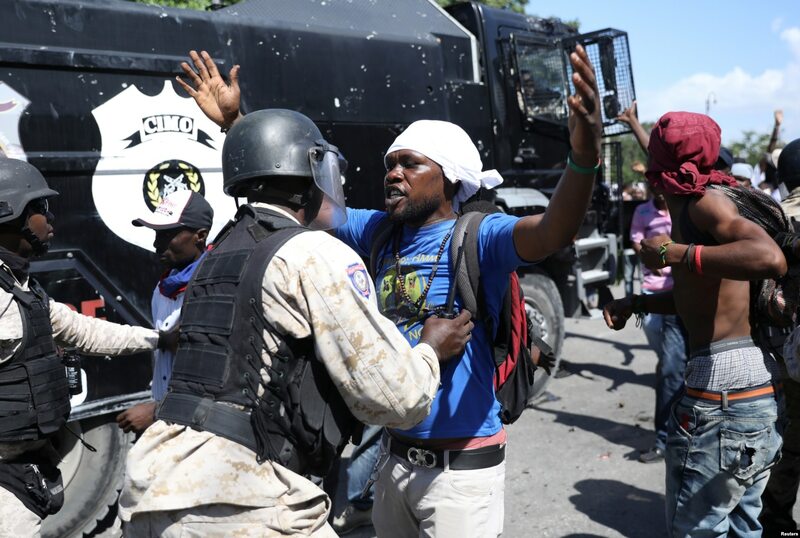 The lead up to the protest was filled with intimidation by the state and the Haitian ruling class, with a police memo fearing attacks on that day and some opposition party lawyers getting questioned by a state prosecutor about the protests. 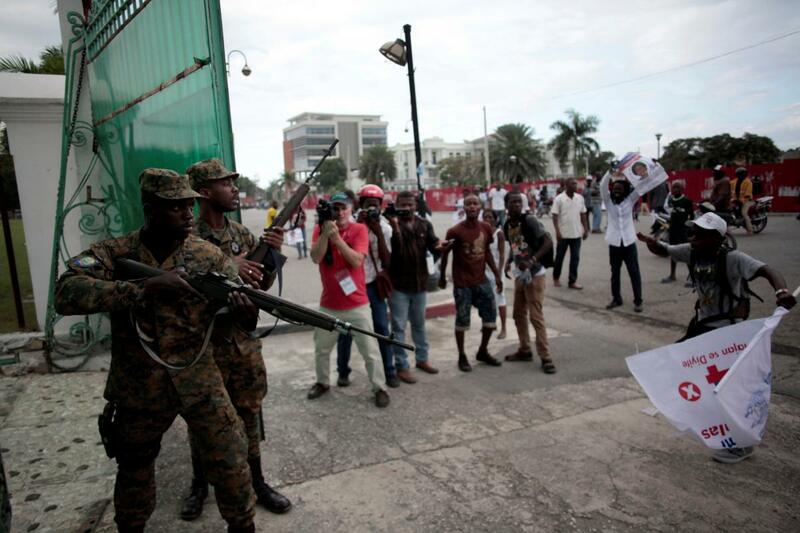 Tensions begin to rise higher as highschool students begin to join the protests and videos begin to circulate of wealthy Haitians shooting weapons as a threat against the upcoming protest and in the days leading up banks and businesses begin to take steps to prepare. For us as insurrectionary anarchists in North America the inevitable revolts to come as the crumbling Haitian state tries to save itself offers us a chance to on one hand chip away at our movement's eurocentrism and on the other elaborate a practice of internationalism. However, if our anarchism is to be internationalist, if we want to generalize insurrection across borders and across identities, we must actively be looking for and taking part in revolt outside of the usual places and identifying ourselves not just with anarchists but with anarchistic and ungovernable forces, of course with a critical eye to the content of their politics lest we relive the anarchist fascination with the 2014 Ukraine revolts that had anarchists unknowingly cheer-leading for neo-nazis because they fought police. When we talk of elaborating a practice of internationalism, and particularly in the context of Haiti, we are talking about everything from intervening in workers struggles and forming state-side support campaigns to counter-information campaigns about and attacks against the means and logistics through which the United States intervenes in Haiti – through the State Department, the CIA, USAID, the U.S. Military, and through the United Nations. As has been noted in many other instances the left path of electorialism runs up against the dictatorship of capital and the need of the state to first and foremost secure the existence of the state even at the expense of those it governs. In Haiti, with the direct and constant meddling of the US and UN, the military, and bourgeois leftovers of the Duvallier era, left electorialism is only a set up for worse to come. If there is hope for real peace and stability for the Haitian people it will come through abandoning political parties and state machinery in favor of building the autonomous power to take care of and defend each other. We can see the seeds of this in the autonomous revolts initiated by the Haitian people rather than called for by opposition parties and in groups like the autonomous workers organization Batay Ouvriye. All struggles for liberation are connected, those directly happening in the backyard of the United States directly affect our struggles, and ours theirs. We will be continually keeping an eye on unfolding social conflict looking for ways to support struggle stateside, and we hope others do as well. If there is hope for real peace and stability for the Haitian people it will come through abandoning political parties and state machinery in favor of building the autonomous power to take care of and defend each other.